NYSE Markets | Data-driven insights from our trading systems and thoughts on key market structure topics. 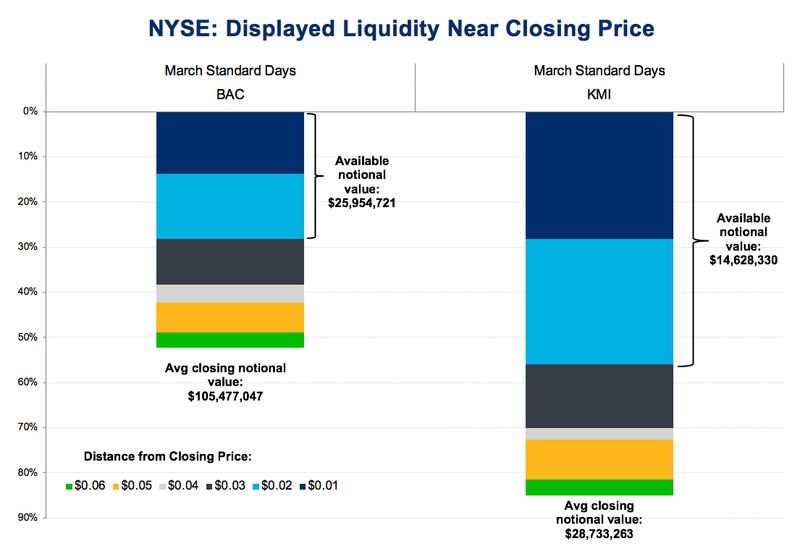 The charts below show the aggregate unexecuted interest available during the Closing Auction near the closing price for specified trading days. By sending orders with looser limit prices, traders may gain access to substantially more volume with only minimal impact to the closing price. For example, in the S&P 500, 36% more volume could have traded within 10 basis points (bp) of the closing price on an average day in March. In the Russell 2000, 161% more volume could have traded within 50 bp of the closing price. The above charts show all interest, both displayed and non-displayed (such as LOC orders). Additionally, monitoring the displayed depth on the NYSE leading into the Closing Auction can reveal substantial interest priced near the eventual close. The Closing Auction accounts for more than 8% of NYSE-listed volume thus far in 2019. As the above data shows, the auction’s liquidity has attracted a deep book of opportunistic volume priced near the eventual closing price. This creates unique liquidity opportunities for traders to execute block-size liquidity with minimal impact by entering LOC orders with looser limit prices or providing further discretion to their floor brokers. Can You "De-Fragment" Small Cap Trading? With a record year behind us, we wanted to follow up our 2018 Options Market Review with an analysis of the options market in Q1 2019. The market experienced a drop in volatility from the highs of Q4 2018, which also brought a reduction in equity option volumes. Market quality benefited from the low-volatility environment as quoted size and some spreads improved over the quarter and options volumes became significantly less concentrated in the top 50 symbols. Volatility was driven downward as the VIX closed below 13.00 for the first time in over 5 months on March 15, 2019. Lower volatility depressed options volumes, with Q1 2019 equity option ADV finishing at 17.3mm, down 12.9% from the prior quarter. Despite this reduction in volume, Q1 2019 was the second most-active Q1 of all time, trailing only Q1 2018. As volatility decreased, posted size increased significantly. Notional size in Penny class symbols increased over 75% and in Non-Penny class symbols increased over 80% from Q3 2018 to the end of Q1 2019. 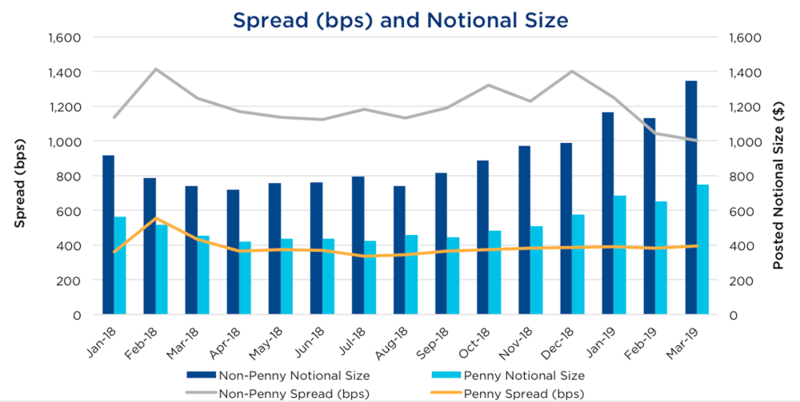 Market-wide quoted bid-ask spreads (measured in basis points) stayed relatively flat as spread widths tightened at the same rate as option values decreased. Quoted spreads in Non-Penny symbols were an exception as they tightened by 28.5%. Data using methodology described in 2018 Options Market Review and excludes SPY. Q1 2019 also saw reduced equity option volume concentration. We found volume less concentrated in the top 50 symbols by ADV, and market volume attributed to the top 10 symbols dropped 8%. 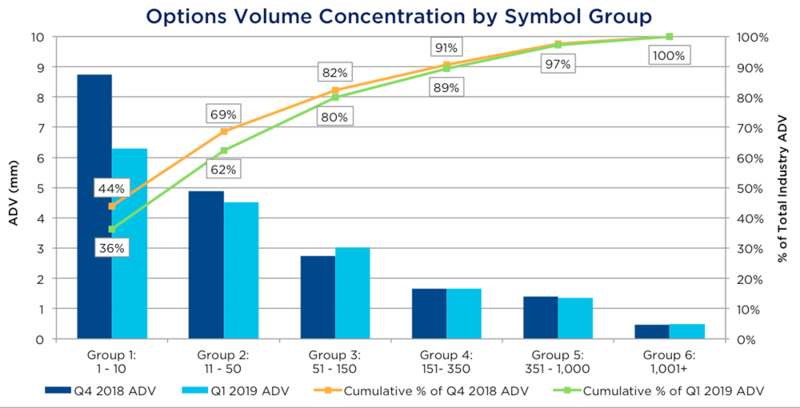 Volumes actually increased from the prior quarter in symbols ranked 51 through 350, which broadened market activity into previously less-liquid symbols. Options markets currently show an implied probability of VIX being 15 or lower of about 65% 3 months out and 55% 6 months out. The reduced uncertainty yielded an improvement in displayed options market quality with larger posted size and flat or narrower bid-ask spreads. Although volumes have decreased in the most active options, interest in some of the less active symbols increased to this point. The NYSE carefully reviewed the recently published report from MITRE entitled, " Scaling of Inefficiencies in the U.S. Equity Markets: Evidence From Three Market Indices and More Than 2,900 Securities." While we appreciate the complexity of the data and calculations required to produce the report, we believe there are serious flaws in the methodology. These issues lead the report to overstate the scale of the alleged issue. The report investigates "latency arbitrage opportunities and realized opportunity costs" from trading in stocks in the Russell 3000® index during 2016. The paper attempts to identify trades that occur when different data feeds show different prices at the same time. The paper estimates that 23.71% of all trades occur when the National Best Bid and Offer (NBBO) calculated from exchange proprietary data feeds is different from the NBBO published by the Security Information Processors (SIPs). The paper estimates that these trades result in an annual "realized opportunity cost (ROC)" of greater than $2 billion. This result is substantially different than the Bartlett and McCrary paper (2017)1, which estimated that the SIP and direct feeds showed a different price for just 3% of all trades and that potential opportunity costs were an order of magnitude lower. We believe there are a few key issues leading to an inaccurately high cost estimate. An execution on another venue such as NYSE for 200 shares at the SIP NBB of $10.00. The authors informed us that they calculate the ROC on the 200 shares executed at the SIP NBB of $10.00, or $0.01 per share, resulting in a $2.00 ROC. The paper assumes both quotes are equally accessible at the same instant, but disregards the fact that 200 shares could not have executed at $10.01 on Nasdaq; Nasdaq was only showing 100 shares available on its direct feed at the better price. Extending this example, if multiple trades executed at $10.00 on different venues, before the SIP quote was updated, each of these would be counted towards the ROC. This implies that potentially any number of shares were available for arbitrage, when there were really only 100 shares that could offset any trade. For there to be an arbitrage opportunity, one must be able to execute the opposite leg of the full quantity of the trade. Our second key issue is that we are not clear how the authors handled odd lots quoted on direct feeds. If they calculated an NBBO based on odd lots they would further exacerbate the over-estimation described above. The authors could avoid this problem by looking for executions in odd lot size at the prices quoted on the direct feeds. If the odd lot trades occur, it is clear that the shares are no longer available and any subsequent trades at the SIP NBBO could not possibly be afforded an arbitrage opportunity. Third, we learned from the authors that they sourced the unified SIP and proprietary feed data from Thesys based on data they collected in Carteret, NJ. We believe running such a study from a more neutral geographic location, such as Secaucus, NJ, would lead to significantly fewer perceived arbitrage opportunities. While the authors took a measured approach to try an account for the geographic latencies between the three New Jersey exchange data centers, those latencies are not static and can vary based on a variety of factors, such as spikes in market activity and telecommunications performance. Fourth, the executions used to calculate potential ROC were sourced from the SIP rather than from the proprietary feeds. Exchange proprietary feeds publish executions in addition to quotes, and we believe that using executions from these proprietary feeds would indicate far fewer potential arbitrage opportunities. Due to these issues, NYSE concludes that the results presented in the paper are flawed and do not reflect actual latency arbitrage opportunities and costs. The jump in market volatility in 2018 has provoked several concerns regarding the nature of today's electronic trading environment. The NYSE's unique hybrid market model, which features a Designated Market Maker (DMM) obligated to provide liquidity and facilitate auctions, offers unmatched stability relative to other global markets, especially during times of market turbulence. NYSE's auctions differ from those at other equities exchanges because they combine human judgment exercised by the DMM who oversees trading activity, with automated mechanisms. This enables NYSE to conduct a manual auction if deemed necessary by market conditions. To conduct the auction, the DMM aggregates buy and sell interest and executes the maximum volume at a price intended to be reflective of market supply and demand. The manual auction therefore gives the DMM both price and time flexibility, unlike electronic auctions which because of their automated nature are more susceptible to large price dislocations due to temporary supply and demand imbalances — a scenario which occurred recently during an auction on the Singapore Stock Exchange (SGX). The risk of fast, automated executions has led many global exchanges, including NYSE Arca, NYSE American, and Nasdaq, to implement auction "collars" with others coming on line shortly1. These collars set price thresholds to help to dampen auction price movement. However, the NYSE Opening Auction consistently outperforms electronic auctions, especially during volatile periods. The NYSE Closing Auction, which is more than 7.5% of total NYSE-listed trading activity, similarly outperforms other auctions. 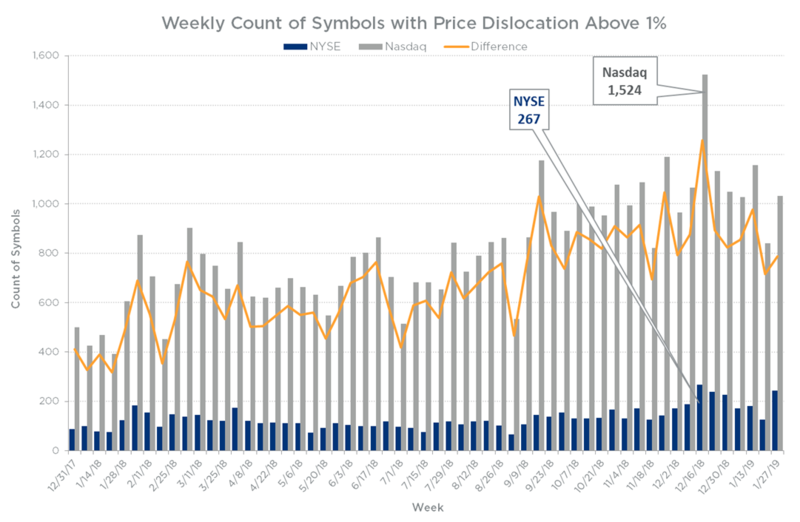 The chart below shows the weekly count of symbols that experienced price dislocations2 above 1% for both NYSE and Nasdaq Closing Auctions, and the difference between the two measures. 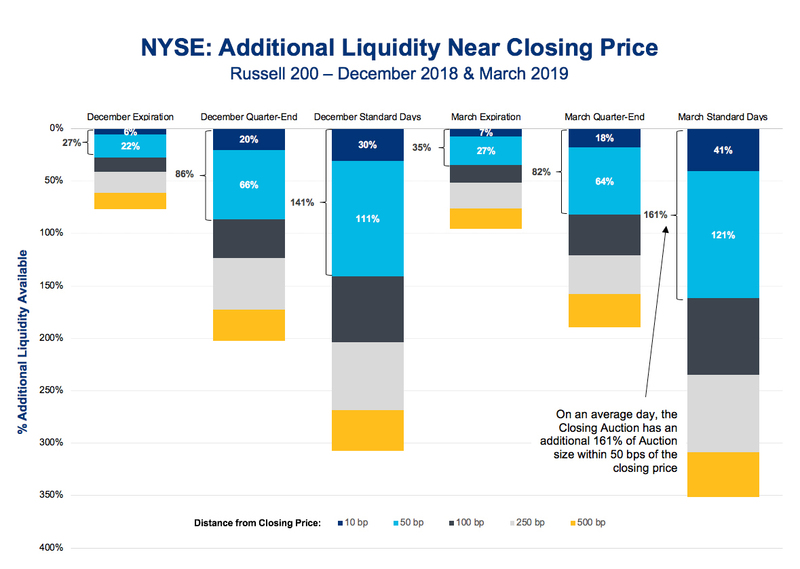 As the chart shows, while auction price dislocation tends to increase during periods of heightened volatility, the dislocation in the NYSE Closing Auction is far less severe compared to the dislocation that occurs in the Nasdaq Closing Auction. This is attributable to the DMM's ability to help find relevant closing prices even in challenging market conditions3. How Can This Help Traders & Investors? While Closing Auction volumes have grown in recent years, there is still substantial liquidity available that remains unexecuted near the closing auction price. 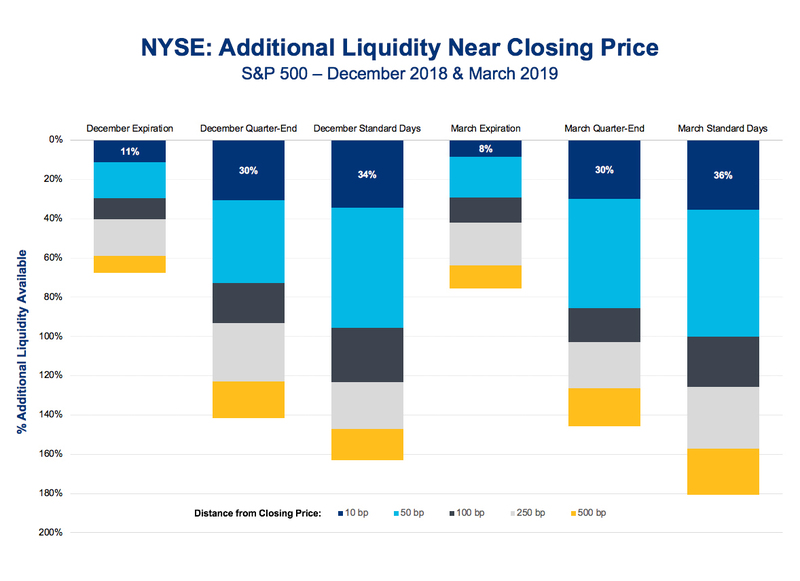 Investors and traders can benefit from this additional liquidity with relatively less impact than during intra-day trading (we'll update this analysis in a forthcoming post). NYSE is planning to list exchange-traded products (ETPs) on the NYSE, to deliver the DMM's improved market quality performance to this fast-growing asset class. 2 Price dislocation is defined at the difference in basis points between the Closing Auction price and the market volume-weighted average price in the 5 minutes before the close. 2018 was a historic year for equity markets, with major indices reaching record highs before retreating to finish down for the year. Volatility made a comeback, but how did it compare to recent years? Vol of Vol: Volatility, as measured by VIX, peaked at an intraday high of 50.30 on February 6, 2018. The intraday low was 8.92 (on January 4, 2018). This 41.38 range was the largest point range seen since 42.41 in 2015. Trading Volumes: The heightened volatility brought large increases in trading volume, with total consolidated volume in October 2018 reaching its highest level since August 2011. Total volume in Q4 2018 was the highest for any quarter since Q3 2011. December 21 was a perfect storm for strong volumes: high volatility along with quarterly expiry and rebalancing led to the highest volume day since August 9, 2011. 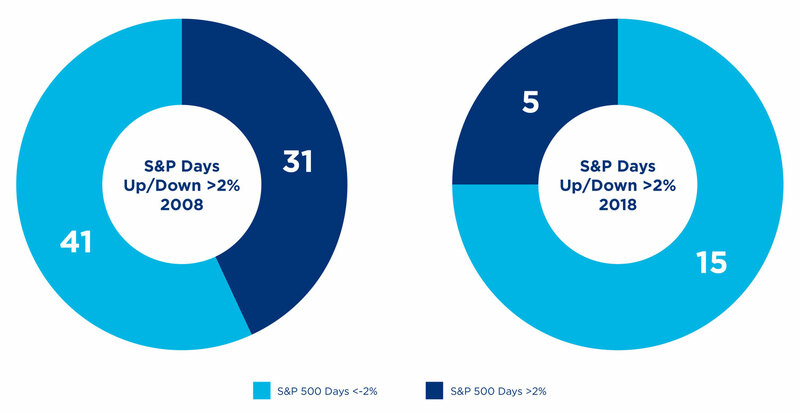 In 2018, major equity indices experienced the most single-day moves >2% since 2011. The S&P 500 had 20 of these large moves (5 up, 15 down). The Nasdaq had 32 large moves (11 up, 21 down). The Dow Jones Industrial Average had 21 large moves (6 up, 15 down), and 154 days (out of 251 trading days) with 100+ point moves (83 up, 71 down). The number of these large moves in 2018 were a stark contrast to 2017, which had no single-day moves >2% in the Dow or S&P and only three such days for the Nasdaq. By some of the above measures, 2018 was the most volatile year since 2011. However, 2018 was far less volatile than the extreme conditions observed at the start of the financial crisis in 2008. Volatility returned to US markets in 2018, leading to record equity options trading volumes. At the same time, there was increased interest in options market quality, particularly as it relates to the displayed quote.1 Given NYSE’s advocacy for robust displayed markets, and the unique nature of the year’s volatility and volume, 2018 was an ideal year to study the influence of volatility on quoted spread and size. We found that adjustments for option prices can dramatically alter the interpretation of market quality metrics: after converting quoted bid-ask spread values from cents to basis points and converting quoted size from contracts to dollars, the data shows that displayed market quality was fairly consistent during some of 2018’s volatile periods. Our analysis leveraged NBBO quote data provided from S3 and was limited to the top 15% of symbols by options ADV. We focused on options with underlying symbols that had at least 1,000,000 shares of ADV, removed any new listing and delisting, and removed symbols that changed Penny Pilot groups during the year. Finally, we excluded SPY so as to not skew the results. SPY accounts for nearly 20% of options volume, and this scale likely gives it market structure attributes not common to the rest of the tradable universe. The resulting list of symbols accounted for 71% of total equity options volume. In the charts below, we plotted monthly average spread and size for Penny Pilot (PP) and Non-Penny Pilot (NPP) symbols. In 2018, NPP names had a spread of roughly 3x the spread of PP names, accompanied by 60% greater size compared to PP names. NPP posted size fluctuated over the year, ending the year higher than it began. We also observed that spread widths for NPP symbols fluctuated more than PP symbols in nominal terms, but less so using normalized measures. How Did Volatility Affect Option Spreads? Nominal spreads followed the fluctuations of the VIX closely. We saw nominal spreads widen with the elevated VIX levels in February and March, as well as in October through the end of the year. When we adjust the spread calculation to show percent of option price in basis points, spreads still appeared wider in February, but were more muted the rest of the year. We hypothesize that the speed at which VIX spiked in February, moving from 13.47 to 37.32 in two trading days, had a greater impact on spread widths compared to the more gradual rise of VIX across months late in the year when it rose from 11.61 to 36.07 in 56 trading days. The normalization shows that although nominal spreads increased, they increased proportionally and in tandem with option prices. In our population, average option prices increased by 31.5%, whereas spread widths only increased by 25.5% in Q4. The impact of these price normalization steps can be particularly meaningful at an individual symbol level. 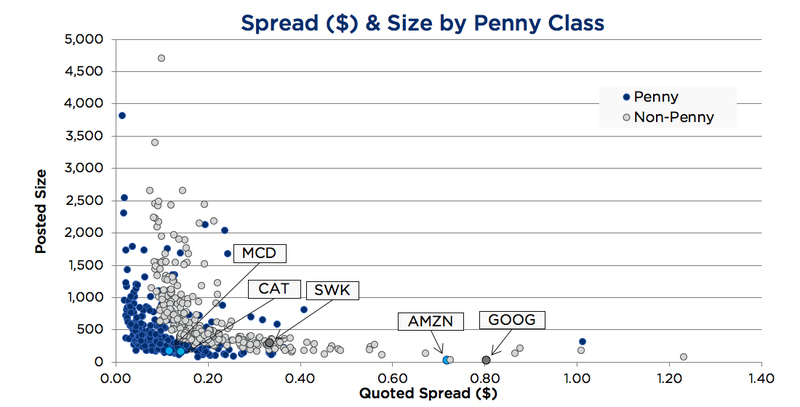 In nominal terms, high-priced symbols Google (GOOG) and Amazon (AMZN) had some of the worst spreads and posted size. 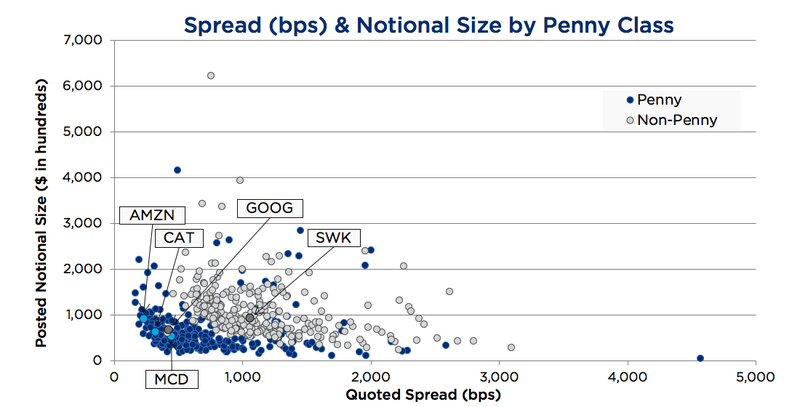 However, in notional terms, GOOG had the tightest quoted spread of all non-penny symbols (422 bps) and moved much closer to the average posted notional size of $85,000; AMZN experienced similar results. Additionally, household names such as McDonald’s (MCD), Caterpillar (CAT), and Stanley Black & Decker (SWK) exhibited tightened quoted spreads after we converted from nominal terms to basis points. We believe that converting spread and size to notional terms may change perceptions of market quality and improve the ability to compare among symbols. Unlike the US listed options market, many global markets of various asset classes use notional values for quote and trade increments. The above analysis details the merit of using notional values for assessing US listed options market quality, especially in highly volatile times. 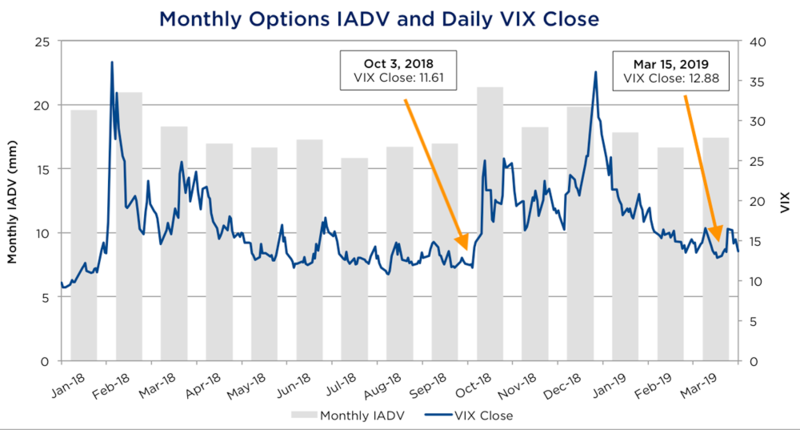 This perspective shows that the US listed options market handled 2018’s volatility fairly well, particularly when the elevated volatility was sustained over a period of time. At last month's hotly debated SEC market data roundtable, there was passionate discussion over both the nature of competition and fees charged for market data and market access. Some around the table, including IEX, chimed in that exchanges should only charge transaction fees. Market data and connectivity services, they said, should be provided for free. We disagree. Exchanges are integrated enterprises that bring broad value through trading and technology services, but not all clients use every exchange offering. Allowing investors to order a la carte empowers each to select the blend of services they need. By contrast, charging high transaction fees but "giving away" data and connectivity is like requiring all diners to order a prix fixe tasting menu. Importantly, the current competitive market structure allows investors both choices. While the blend of exchange revenues has shifted from purely transactional to a mix of execution and technology, the overall costs on NYSE markets remain a bargain. In fact, the All-in Cost to Trade on NYSE Group exchanges is lower than on IEX or on many dark pools. Keep your eyes on the prize: the All-in Cost to Trade on NYSE Group exchanges is less than $0.0007 per share. 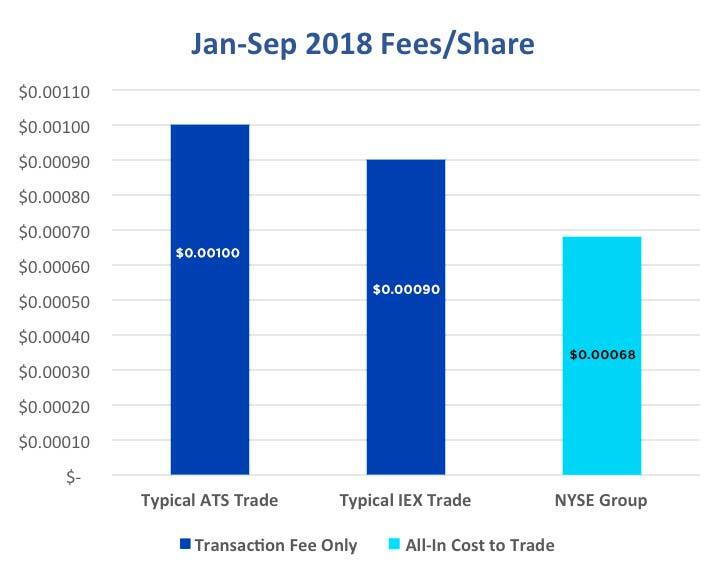 For our members, compare that to the $0.0009 transaction fee per share that IEX charges for most of its trading, and to a typical ATS fee of $0.0010 per share. In fact, NYSE's competitiveness is understated in the comparison above as 1) the NYSE group calculation includes some fees associated with multiple NYSE markets, including NYSE Options, and 2) there are still datacenter and telecom fees associated with trading on IEX and dark pools, even if they are earned by unregulated datacenter and telecom providers instead of the trading venue operators. Some market participants have understandably asked for a full breakdown of our calculation. We are happy to oblige, and stand ready to discuss any market participant's specific All-in Cost to Trade upon request. We calculate NYSE Group's All-in Cost to Trade per share in two steps. Applying separate fees for market data and connectivity allows members to choose the right bundle of products for their specific business. For example, members of multiple NYSE exchanges do not necessarily subscribe to the same market data products or use the same number of logical order ports on each venue. Some participants add and remove liquidity evenly, while others are skewed more toward one style of trading. Because market participants choose different trading, data and connectivity services, it's entirely possible that any given member's All-in Cost to Trade may be lower or higher than the average in our calculation. What's your own All-in Cost to Trade? Reach out to us at rmteam@nyse.com to find out.